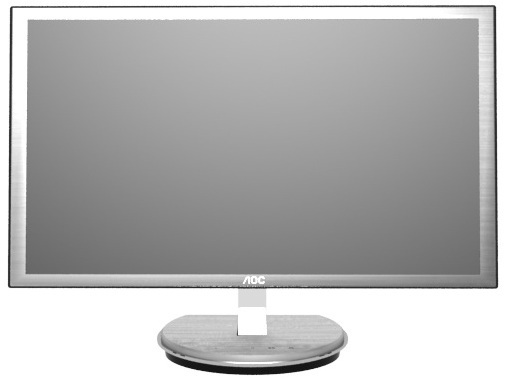 We've never really taken much of a look at AOC monitors since they often tend to be lower cost models aimed at office users. They are normally TN Film technology and don't really spark our interest. 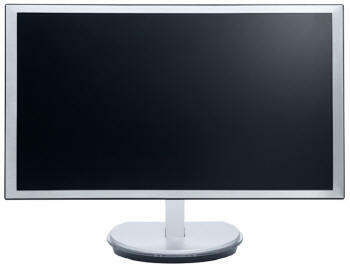 However, recently they have released some new models which do look interesting including their 23" i2353Fh / Ph. This is an IPS based model with W-LED backlighting and a pretty unique design. We are always keen to test new and interesting models like this and so we have the i2353Ph with us for a full review. It should be noted that there are two model numbers for this i2353 screen. The Fh model is available in Europe (including EMEA) while the Ph is the model available in America and Asia. The two models are identical and feature the same panel, features, electronics and specs. We actually have the Ph model with us (which is odd since we are based in the UK). I'll refer to the screen as the i2353 throughout the review to avoid confusion. The i2353 is marketed on AOC's website as follows: "The revolutionary i2353 monitor has a brushed-metallic surface texture, a super slim display body measuring just 9.2mm thin and a slim, transparent crystal stand to further enhance its futuristic styling. The base has illuminated soft-touch controls, and can tilt to transform into a sleek wall mount (VESA standard), allowing the panel to seemingly float in space. So i2353Ph won the "if" design award China 2010". The i2353 offers a reasonable set of features. In terms of video connections there are 2x HDMI and 1x D-sub. For some reason AOC have opted for 2x HDMI interfaces instead of providing a DVI which is a shame. Not everyone has a graphics card with HDMI or access to an HDMI > DVI adapter even. If AOC wanted to stick with only HDMI for a digital connection they could have at least provided an adapter cable for those who need it. HDMI is useful for external devices of course, but I would have personally preferred to see 1x HDMI and 1x DVI. It was also a shame not to feature DisplayPort which is increasingly popular as an interface. The digital HDMI ports are HDCP certified at least for protected content. Cables are provided for HDMI (x1) and D-sub. The display does offer some integrated 2x 2W speakers as well but these aren't up to much. They are very quiet even at 100% volume and only really suitable for the odd 'office sound' or alert I think. There are no further features here such as ambient light sensors or card readers here. Sadly there are no USB ports either which I think are very useful and feature on many modern screens. 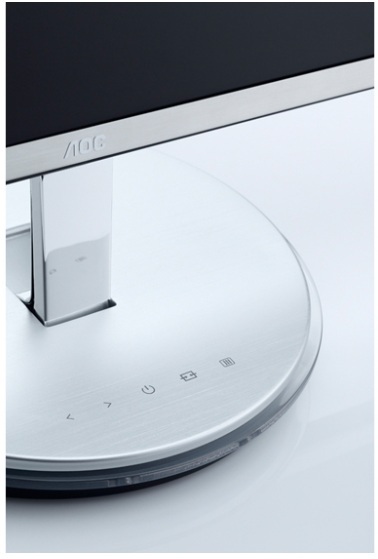 The AOC i2353 comes in an attractive metallic aluminium finished bezel with a very thin black trim along the outer edges. This bezel is a little thicker on the sides where it measures 22mm, as compared with the top and bottom where it is 17mm. In the middle of the bottom bezel is a small shiny silver coloured AOC logo. 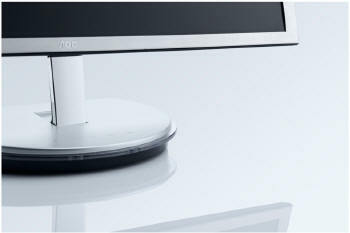 The monitor arm is also a shiny silver colour while the base is a brushed aluminium colour again like the bezel. The above photos give you more views of the front and back of the screen. The screen features a normal anti-glare (AG) coating but this is not as heavy or sparkly as some other competing screens which is pleasing. It seemed to be a low level of coating used here. The back of the screen is encased in a flat glossy black plastic and looks attractive. There is a grey coloured AOC logo here near the top as well. The interface connections are situated on the back of the base as shown. 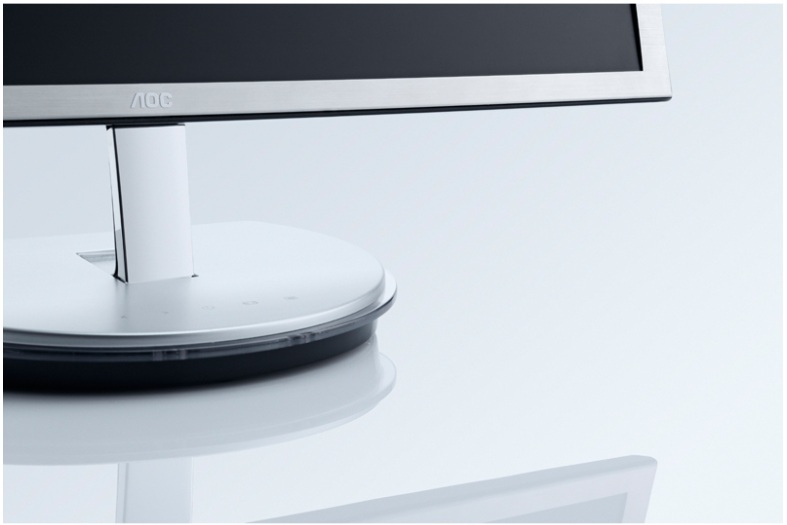 The i2353 looks very sleek and minimalist I must say, helped by its incredibly thin profile. The screen measures only 9.6mm thick thanks to its use of W-LED backlighting and an external power brick. You can see here the incredibly thin profile of the i2353 from the side. The screen has only a tilt ergonomic adjustment which does offer a good range of adjustment forward and backward. This is quite stiff though and difficult to move, partly because of its thin arm and light base. Sadly there is no height, pivot or rotate adjustments available. Perhaps its classification as being part of their "ergonomic" range is a little adventurous. The tilt range is shown above. The stand will allow you to tilt the panel back even further than shown in the second photo but at that point it becomes unstable and will fall over as the base is not heavy enough to support it. It only folds back further to allow you to wall mount it with the stand folded all the way back. The images above are the actual useable range of the tilt adjustment in normal conditions. Limited range of adjustments with only tilt available. This is difficult to use and stiff unfortunately. The screen materials are of a good quality and the design is attractive in my opinion. There is no audible noise from the screen and it stays cool during operation on the most part. The lower edge does become quite hot which is where the W-LED backlighting is situated (edge-lit display). The power brick also becomes quite warm as you might expect. The base is a circular shape. It has a black bottom section with a thin clear plastic trim around it (referred to as 'transparent crystal' in their marketing). Above this there is a bushed aluminium coloured base which matches the bezel of the screen. The power LED is a fairly attractive bar which glows in the centre of this base, and is accentuated by the plastic trim going around the edge. In normal operation this glows a blue colour, and in standby it glows amber. On the top of the base there are small subtle labels for the OSD menu. The buttons for this are not located on the screen itself, but on the base. These are touch sensitive and there is a bit of give in the top of the base as a result. In some places this makes it feel a little separated and creaky, but overall the buttons work quite well. The base also incorporates the 2x 2W speakers. There is a small grill on the side of the base where the sounds emanates. They aren't up to much unfortunately. They are very quiet even at 100% volume and only really suitable for the odd 'office sound' or alert I think. The back of the base offers the connections for HDMI (x2), D-sub VGA, audio in and power. There is an external power brick provided with the screen as opposed to it being integrated into the display. The cables for HDMI and D-sub are provided as well. It was a shame not to see DVI present here, or even a DVI > HDMI adapted perhaps. Not every user will have an HDMI output on their graphics card and so if you want to use the digital connection you must use and adapter, or otherwise stick with D-sub. I'd have rather seen 1x HDMI and 1x DVI personally. It was also a shame not to feature DisplayPort which is increasingly popular as an interface. You can wall mount the screen which is VESA 100mm compliant. Since the interface and power connections are located on the base you must leave this attached however. The stand folds back as shown which can then be mounted. I would have liked to have been able to mount the panel on its own given its appearance and very thin profile. It would have looked very sleek on its own I'm sure. The OSD menu is accessed via the touch sensitive buttons on the top of the base as shown. There is quick access to the Clear Vision modes via the left hand arrow, volume level via the right hand arrow, and input selection via the fourth button along. The menu itself is a wide bar which appears across the screen as shown above. It is split into 6 separate sections which you can navigate through using the left/right arrows. Once on a section you want to view, you just press the menu button to enter it, and then the arrows move you through each option. A press of the 'input' button takes you back up a level. It's fairly easy to use although not as intuitive as some other OSD menus we have used before. The location of the buttons on the top of the base are also a bit annoying as you are forever reaching over and behind your keyboard to access them. The first section of the menu is labelled as 'luminance' and features options to control the brightness and contrast as normal. You can also control the ECO mode option which offers a range of preset brightness levels ranging from 20 to 100. They are text (20), internet (40), game (60), movie (80) and sports (100). A standard mode also offers you your own customisable brightness level. This luminance section also allows you to control three preset gamma modes which we will test later on as well as turning the dynamic contrast ratio (DCR) option on and off. The second section is the 'image setup' section as shown above, allowing you to control some features when using the analogue D-sub interface. The 'color setup' section allows you to control a series of preset colour temperature modes which we will test later on as well. You can also control their 'DCB mode' which is designed to bring out certain aspects of the images you are viewing, and enhance things like skin tones, green fields and blue skies. There is even an auto-detect feature available here. The DCB demo option splits the screen vertically in two so you can see a before and after view of what this is doing to the content. The RGB sliders are visible here but only accessible when in the 'user' colour temp mode. The picture boost section allows you to create a small window within your image which is then 'boosted' to your liking. You can control the size, position, brightness and contrast of this window, although I'm not sure whether this would be useful in practice to many people. The OSD setup section allows you to control some usual features relating to the menu itself as shown above. The 'extra' section controls a few other features including input selection, an off timer. The image ratio (aspect ratio control) option is also available here with options for 'wide' and '4:3'. Overall the menu offered a reasonable set of adjustments and options and was ok to use. It wasn't as intuitive as some other menus I've used and the movement between sections had a slow animation too. 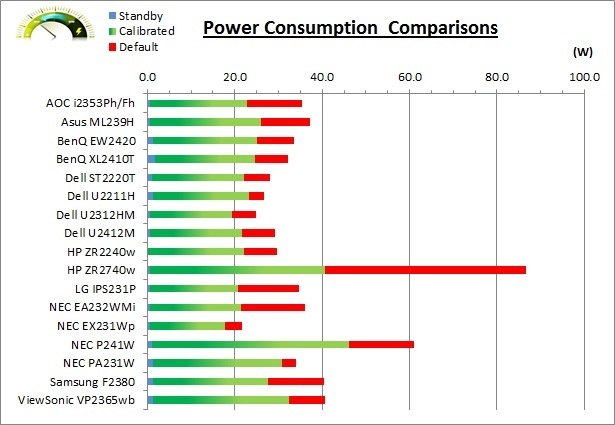 In terms of power consumption the manufacturers spec states typical usage of 25W in normal operation. In standby the screen apparently uses 0.5W and when switched off it uses 0.3W. Not sure why it would still draw power when switched off really but we'll test that ourselves. We tested this ourselves and found that out of the box the screen used 35.4W of power while at its default 90% brightness setting. After calibration, where we had adjusted the brightness control to 25% in the 'user' mode, and therefore decreased the backlight intensity, this was reduced to 22.7W. In standby the screen uses only 0.7W of power. The screen even used this power when manually switched off via the power button which was odd. 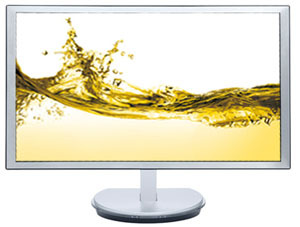 The AOC i2353 utilises an LG.Display LM230WF3-SJC1 e-IPS panel which is capable of producing 16.7 million colours. The panel itself actually uses a 6-bit colour depth with Advanced frame rate control (A-FRC) to produce the 16.7m colours. This is different to regular 8-bit IPS matrices, but this is a measure taken to achieve a lower price point for these modern lower-cost displays. We have not seen this specific revision of the panel used elsewhere before but it is very similar to the other LM230WF3 revisions. The screen uses White-LED (W-LED) backlighting. The colour space of this screen is approximately equal to the sRGB reference and is considered a 'standard gamut' backlight type. 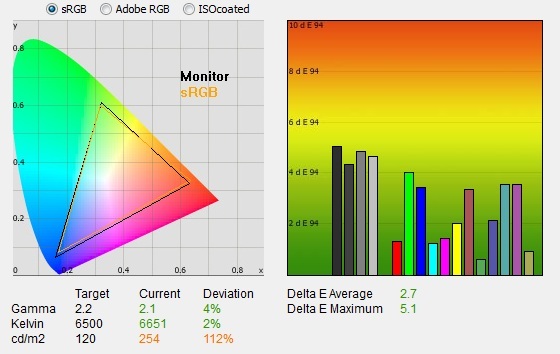 Studying the detailed panel spec confirms the screen covers 73% of the NTSC reference, 76.0% of the Adobe RGB reference and 96.9% of the sRGB colour space. While a 96.9% coverage of the sRGB space is decent enough and in line with most W-LED backlit screens, some higher end uses may require a wider gamut with a full 100% sRGB coverage (and beyond) for graphics and colour work. A wide gamut screen is another option for those wanting to work outside of the sRGB colour space. I restored my graphics card to default settings and disabled any previously active ICC profiles and gamma corrections. The screen was tested at default factory settings using the DVI interface, and analysed using an X-rite i1 Pro spectrophotometer combined with LaCie's Blue Eye Pro software suite. An NEC branded and customised X-rite i1 Display 2 colorimeter was also used to verify the black point and contrast ratio since the i1 Pro is less reliable at the darker end. The out of the box performance of the i2353 was reasonable. The CIE diagram on the left confirms that the monitors colour gamut (black triangle) very closely matches the sRGB colour space (orange triangle). It extends a little past the sRGB space in greens and blues in this 2D view of gamut but is a little short in reds. Default gamma was recorded at 2.1 average, leaving it 5% out from the target of 2.2. Gamma was actually closer to the target 2.2 in the darkest greys where it was recorded at 2.11. This deviated as low as 1.99 in other lighter shades however. White point was a practically spot on here at 6441k which was only 1% out from the target. This was a pleasing setup in terms of white point. Note that we are using a Spectrophotometer to make these measurements which is not sensitive to the W-LED backlight as some colorimeter devices can be. When using a colorimeter with a W-LED backlit screen there can be a typical deviance of 300 - 600k in the white point measurement which is why some sources may refer to a different white point in this test incorrectly. Luminance was recorded at a high 262 cd/m2 which is too high for comfortable use. The OSD is set at 90% brightness and this is far too much. At this high 262 cd/m2 luminance, the black depth was 0.28 cd/m2. This gave us a static contrast ratio of 922:1 which is very good for an IPS panel. Colour accuracy was moderate but not great at default factory settings with an average DeltaE (dE) of 3.0, ranging up to a maximum of 5.6. The screen felt pretty even to the naked eye but was overly bright at these default settings. Some minor OSD adjustments to the brightness can hopefully help improve the default set up for casual users who don't have access to a hardware calibration device. To be fair though this kind of out of the box set up should be fine for most casual users anyway, and they can just adjust the brightness control to suit their working environment. I also wanted to test the default performance of a couple of other preset modes. Here we have tested the sRGB mode. As you can see, overall the performance remains very similar to the 'warm' preset. Gamma was ever so slightly closer on average with 4% deviance from the 2.2 curve we wanted. White point was very close but a little further out by 1% compared with before. Colour accuracy was a little better with average dE of 2.7. No real differences in this mode to shout about really. I also reverted the screen to the 'user' mode which had an immediate impact on the luminance of the screen. The brightness control was still at 90% but the luminance had dropped here to 119 cd/m2. This was now very close to the desired 120 cd/m2, but had a major impact on the contrast ratio, reducing it from 922:1 to 415:1. Closer inspection of the rest of the OSD menu showed us that at default, the RGB levels were now set at 50 each as opposed to 100. This has the same effect as lowering the contrast control of the screen and so an adjustment has been made to the digital white level. This has produced a lower luminance, but impacted contrast ratio significantly. 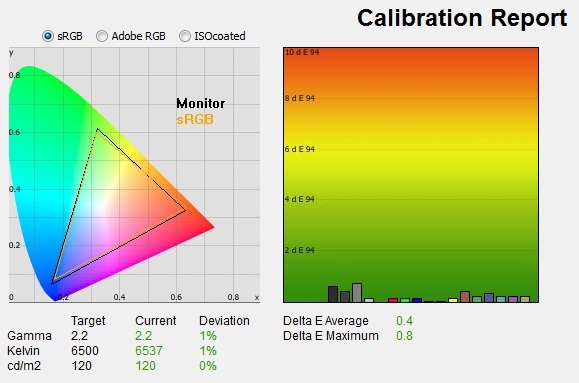 When we come to calibrate the screen we will want to raise these RGB levels higher to restore the CR as best we can. Other than that rather significant change, the colour temperature was also a bit further out now and the image was a bit cooler at 7416k (14% out). Colour accuracy had improved a little as well with dE average now 2.5, maximum of 4.5. This mode might be a good option for calibration when we get to that section, but we would need to ensure that contrast ratio was improved. I wouldn't recommend using it at its default setup though. I also wanted to briefly test the three gamma modes which are available via the OSD menu. All other settings were left at factory default, and we simply changed the gamma option in the menu. The default mode is gamma 1 and this produced a gamma of 2.1 average and a 5% deviance from our target of 2.2. As you can see, the gamma is closest to 2.2 in the darkest grey shades, but does drop down to 1.99 in the lighter shades. Switching to gamma 2 gave us an average gamma of 2.0 and an 8% deviance. This had only made the darkest shades a little closer to the 2.22 target, while all the other shades were now further out from the ideal. The lightest shades dropped down to 1.75 which left a significant difference. Finally gamma 3 gave us an average gamma of 2.3 and a deviance of 3%. On average, this was the mode which was closest to the 2.2 target of our tests, that being the default for computer monitors. The darker tones had actually exceeded the 2.2 gamma here, but the lighter tones were closer than they had been before. This would probably act as an optimum starting point for the gamma of the screen before calibration. As you can see, the 'warm' preset mode is actually very close to the 6500k mark which is our target during these tests, that being the temperature of daylight. The 'normal' mode was a fair bit cooler at 7253k, while the 'cool' mode was 9494k. The sRGB preset was very close to the 'warm' mode, again being ~6500k. The user mode was cooler and was close to the 'normal' temperature preset at 7423k. You will probably want to use either the 'warm' or sRGB modes if you want to obtain a white point of ~6500k out of the box. I wanted to calibrate and profile the screen to determine what was possible with optimum settings and profiling. I used the X-rite i1 Pro spectrophotometer combined with the LaCie Blue Eye Pro software package to achieve these results and reports. An NEC branded and customised X-rite i1 Display 2 was used to validate the black depth and contrast ratios due to lower end limitations of the i1 Pro device. I first of all switched the the user preset mode which would allow me to make the maximum amount of change to the screens settings, including the RGB channels. I changed these from their default 50 settings however to 100 before the calibration process as we had already seen that the default had a major impact on contrast ratio that we wanted to avoid. I followed LaCie's calibration process through, adjusting the OSD brightness and RGB settings in line with the recommendations made in the process, and then letting the software carry out the LUT adjustments at a graphics card level and create an ICC profile. The screen does not feature a hardware LUT calibration option so other than the OSD alterations, the rest of the process is carried out at a graphics card level in profiling the screen. The calibration was a great success. I had initially calibrated the screen when using the gamma mode of 3 since that seemed to return the closest accuracy out of the box to the 2.2 average we were looking for. Average gamma was now corrected with 0% deviance from the average. You can see that the gamma was ever so slightly higher in darker tones than the target, and ever so slightly lower in the lighter tones but this did average out to 2.2 exactly. For those interested, I also followed the same process when in gamma mode 1 which yielded the above results. At the 75% light grey level gamma was spot on at 2.2, but it did deviate down to 2.17 in darker shades. Overall gamma was a little further out, with an average of 2.175. This was still only 1.1% out from the target on average. White point had been corrected from the 14% deviance we had seen out of the box in this 'user' mode. It was now <0.5% out at 6511k. A luminance of 120 cd/m2 had been achieved, but with the RGB levels now set a lot higher than default, we had a vastly improved contrast ratio from this user mode, improving it from 415:1 default to 794:1. This was reasonable for an IPS panel. Colour accuracy had also been corrected nicely through this profiling with an average dE of 0.3 and a maximum of 0.8 now. LaCie would consider colour fidelity to be excellent here. I tested the screen using various colour gradients which showed very smooth transitions and no apparent banding. There was some slightly noticeable gradation in darker tones which is normal for most screens but was very slight here. There was also some very slight temporal noise evident, particularly in darker tones if you look very closely. This is a result of the FRC algorithm used to produce the 16.7 million colour palette. It's not something you'd notice in practice, and you do have to look very closely to see it. In reality although the panel used is a 6-bit + A-FRC module, there is no noticeable issue with this in terms of colour gradation and performance. You can use our settings and try our calibrated ICC profile if you wish, which are available in our ICC profile database. Keep in mind that results will vary from one screen to another and from one computer / graphics card to another. I switched to the 'Warm' preset mode as well to see what could be achieved through profiling in this setting. Since this did not allow you to change the RGB levels at a hardware level yourself, the only change I was making to the screen was to the brightness control. I started in gamma mode 3 since that had returned us the closest gamma curve to 2.2 previously. The calibration was again a success. The performance pretty much matched that of our calibrated 'user' preset. Gamma was 1% out with an average of 2.2. White point was 1% out at 6537k. With a luminance of 120 cd/m2 after calibration we had a black depth of 0.14 cd/m2 and a static contrast ratio of 835:1. This was a little higher than the user mode where we had also lowered the RGB controls a little to aid calibration. Colour accuracy was again very good with dE average of 0.4 and maximum of 0.8. You may want to stick with the user mode however for optimum control over the hardware. Again, you can use our settings and try our calibrated ICC profile if you wish, which is available in our ICC profile database. Keep in mind that results will vary from one screen to another and from one computer / graphics card to another. I've provided a comparison above of the i2353 against some of the other screens we have tested in a similar size range. Out of the box average dE was 3.0 on the i2353 which was moderate. The default colour accuracy of the i2353 was a little behind, but quite comparable to some of the other 23" IPS + W-LED models we have tested including the Dell U2312HM (2.2), NEC EA232WMi (2.4), LG IPS231P (3.1) and the Asus ML239H (2.3). The slightly larger 24" Dell U2412M was quite similar as well at 3.2 average dE. The professional grade 23" NEC PA231W was better still at 1.3 dE average. A reasonable performance in terms of default colour accuracy from the i2353 and only a little behind most of the competition really. Some form of software profiling using a colorimeter would of course be beneficial to correct some of the colours. Once calibrated the dE average was reduced to 0.3. This would be classified as excellent colour fidelity by LaCie. It was not quite as low as some of the other screens here which reached down to 0.2 average, but in practice you would not notice any difference here. Some of the professional range models from NEC are even more accurate. Professional grade monitors like the NEC PA series also offer other high end features which separate them from some of these other models, including extended internal processing, 3D LUT's and hardware calibration. These comparisons are based on a small selection of tests, so it should be remembered that other factors do come into play when you start talking about professional use. For further information and tests of a high end professional grade screen with hardware LUT calibration, you may want to have a read of our NEC SpectraView Reference 271 review. The black depth and contrast ratio of the i2353 were ok, but not great for an IPS panel. Calibrated black depth was 0.15 cd/m2 (user mode) which left it a little behind some of the other models we have tested and gave us a static contrast ratio of 794:1. I have used the black depth from the calibrated 'user' mode since that had returned the best performance in our tests and allowed us most control over the screen hardware settings. 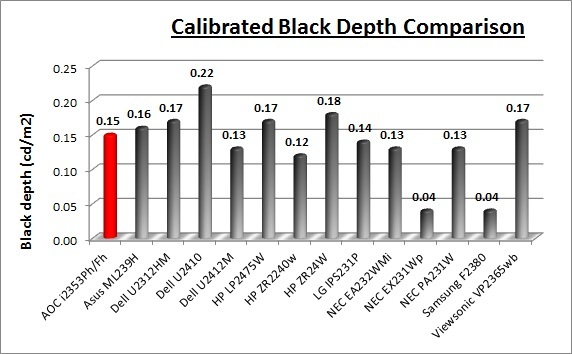 The black depth and CR were a bit ahead of some other similar IPS + W-LED models like the Asus ML239H (749:1) and Dell U2312HM (749:1). 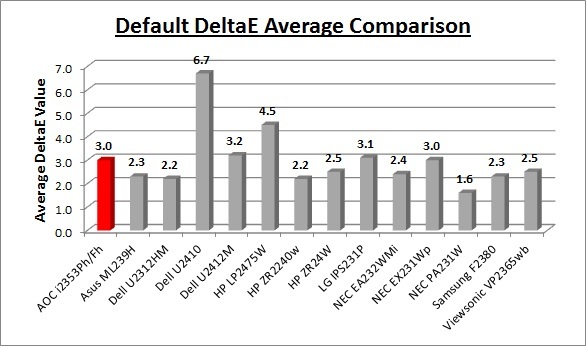 It was however behind others though like the NEC EA232WMi (933:1) and Dell U2412M (947:1). 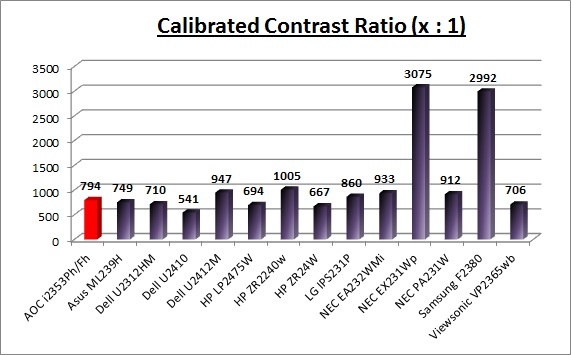 The Samsung F2380 and NEC EX231Wp with their cPVA panels offered some fantastic contrast ratios of ~3000:1 which IPS cannot compete with at the moment. I wanted to see how much variance there was in the screens contrast as we adjusted the monitor setting for brightness. In theory, brightness and contrast are two independent parameters, and good contrast is a requirement regardless of the brightness adjustment. Unfortunately, such is not always the case in practice. 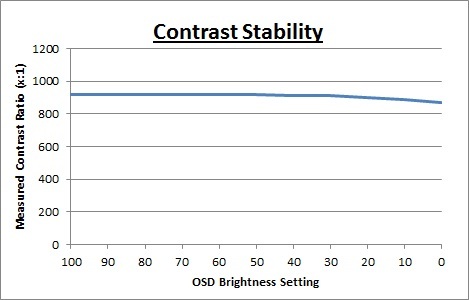 We recorded the screens luminance and black depth at various OSD brightness settings, and calculated the contrast ratio from there. Graphics card settings were left at default with no ICC profile or calibration active. Tests were made using an NEC branded and customised X-rite i1 Display 2 colorimeter. It should be noted that we used the BasICColor calibration software here to record these, and so luminance at default settings may vary a little from the LaCie Blue Eye Pro report. The luminance range of the screen was fairly decent. At the top end of the scale the luminance reached 276.1 cd/m2 which was a little higher than the specified maximum brightness of 250 cd/m2. At 0% brightness the screen could reach as low as 87.1 cd/m2 which should be ok for most users, even in darker lighting conditions. This wasn't as low as some other models we have tested but should suffice. There was a total adjustment range of 189 cd/m2. Black depth was lowered as you reduced the backlight intensity as it should be, ranging from 0.30 to 0.10 cd/m2. We have plotted the luminance trend on the graph above. The screen behaves as it should, with a reduction in the backlight intensity controlled by the reduction in the OSD brightness setting. This is a straight linear behaviour. Static contrast ratio remained very stable across the adjustment range, with an average figure of 909:1 which was very good. These contrast measurements were plotted on the graph shown above. 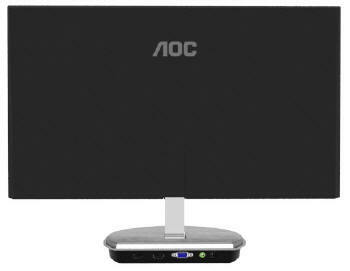 The AOC i2353 features a dynamic contrast ratio (DCR) control, which boasts a spec of 50,000,000:1 (50 million:1). Dynamic contrast ratio involves controlling the backlight of the screen automatically, depending on the content shown on the screen. In bright images, the backlight is increased, and in darker images, it is decreased. For this test I would use the colorimeter to record the luminance and black depths at the two extremes. Max brightness would be recorded on an almost all white screen once the DCR has caught up. Black depth would be recorded on an almost all black screen. In real use you would never get a 100% all white / black screen, and even these tests were an extreme really for the purposes of measuring a potential maximum useable dynamic contrast ratio. The DCR feature is only available in the 'luminance' section of the OSD menu as shown above, with a setting for on and off available. This is available no matter which colour temperature preset you are in. If you are in any ECO mode other than 'standard' though, it will automatically revert you back to standard when you turn DCR on. The rest of the controls in the 'luminance' section then become greyed out. The tests that we carry out to measure dynamic contrast ratio involve an almost completely white and almost completely black screen. In real use you are very unlikely to ever see a full black or full white screen, and even our tests are an extreme case to be honest. Carrying out the tests in this way does give you a good indication of the screens potential maximum dynamic contrast ratio in real life situations however. The DCR did seem to work reasonably well which was a pleasant change from most modern screens we test. The transitions are very smooth and quite slow to happen. It takes around 8 - 9 seconds to change between the maximum and minimum brightness levels as controlled by the DCR it seems. It's quite hard to spot these but you can see a gradually dimming luminance of the screen as you switch between light and dark content. The OSD menus brightness setting remains greyed out and does not change, so it's not possible to spot via the menu how fast or slow the changes are, and to what brightness levels the screen is being set. Maximum luminance was recorded at 264.01 cd/m2 and minimum black point was 0.13 cd/m2. This gave us a useable dynamic contrast ratio of 2031:1 which was reasonable. Obviously nowhere near the specified 50 million:1 figure though. Even if we assumed the DCR feature could control the maximum range of brightness adjustments from 0 - 100%, we wouldn't arrive at a figure any where near that. If we take the maximum luminance (276.1) and minimum black point (0.10) from our contrast stability section we would only achieve a DCR figure of 2761:1. The real life figure in practice is not far off this at 2031:1. To be able to achieve a figure anywhere near the 50 million:1 the black depth would need to be able to reach as low as 0.000006 cd/m2 which obviously it can't do. In fact you'd have to be turning the backlight off to achieve this but that black would then effectively be 0 cd/m2 and you might as well quote 'infinity:1' as a spec. Some screens do even switch the backlight off when there is a 100% black screen (which you'd never see in real use admittedly) which would explain how some manufacturers get to these crazy specs. In the case of the i2353 that doesn't happen. We'd rather see a modest figure like this 2031:1 which is useable in practice than some crazy spec which you can never even achieve apart from in a lab or extreme tests. Viewing angles of the i2353 are very good, as you would expect from a screen based on an e-IPS panel. Horizontally there are very wide fields of view with a small contrast shift only really becoming noticeable from a fairly wide angle of about 45°. Vertically, the contrast shift was more obvious and appeared at smaller angles away from a central point. The panel is free from any off-centre contrast shift which you see from VA matrices, and this is why IPS technology is so highly regarded in the colour enthusiast and professional space. It is also free of the very noticeable contrast and colour tone shifts you see from TN Film panels vertically. On a black image there is a rather noticeable purple glow from the panel as you can see from the image above. This becomes more pronounced from a wider angle. From a normal line of sight you can see this purple glow towards the corners of the screen as you view from head on, but it is not too bad. In normal working conditions you don't really notice this, but if you were working in darkened room conditions or with a lot of dark content this might prove a problem. There is no A-TW polarizer on this panel which is rarely used now in the market but was implemented on some older screens to improve the off centre black viewing. Measurements of the screens luminance were taken at 35 points across the panel on a pure white background. The measurements were taken using BasICColor's calibration software package, combined with the NEC customised X-rite i1 Display 2 colorimeter. The above uniformity diagram shows the difference, as a percentage, between the luminance recorded at each point on the screen, as compared with the reference point of a calibrated 120 cd/m2. 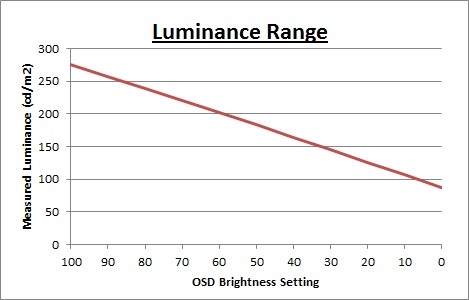 This is the desired level of luminance for an LCD screen in normal lighting conditions, and the below shows the variance in the luminance across the screen compared with this point. It is worth noting that panel uniformity can vary from one screen to another, and can depend on manufacturing lines, screen transport and other local factors. This is only a guide of the uniformity of the sample screen we have for review. The luminance uniformity of the i2353 was moderate, but did show some areas of concern. 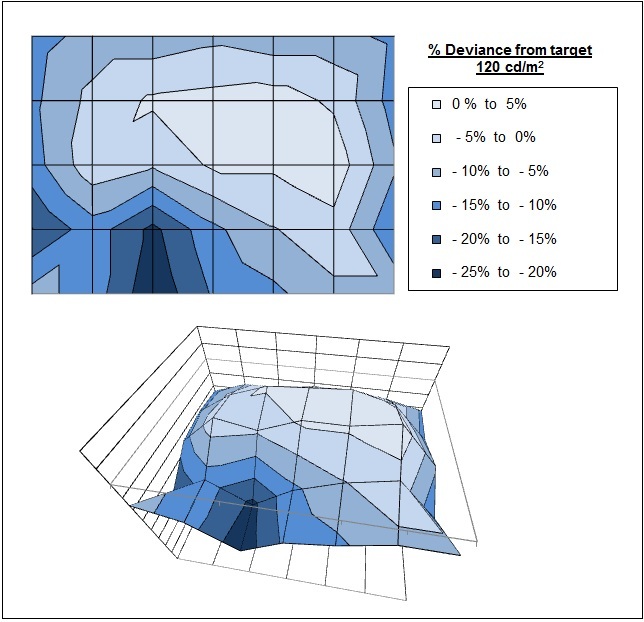 Around 63% of the screen was within 10% deviance from the 120 cd/m2 central point. However the top and right hand half did seem to be closer to this luminance than the other areas. There was some significant deviance in the luminance in the bottom left hand area where it dropped down to 96 cd/m2 in the most extreme case. This result overall was a little disappointing and something to perhaps be wary of. Results may of course vary. As usual we also tested the screen with an all black image and in a darkened room. A camera was used to capture the result. You will immediately notice two rather noticeable areas of backlight leakage from the bottom edge of the panel. This is a shame since the rest of the panel showed very little leakage in this test. This issue along the bottom edge is quite obvious in practice if you are viewing dark content, but not an issue with normal day to day work. Perhaps this is an issue with producing such a thin profile screen as it must be difficult to implement the panel and backlighting in such a small case. The i2353 has a nice high resolution of 1920 x 1080 which is good for side by side office work. I don't think it's as practical as a 16:10 format screen with 1920 x 1200 resolution though as you do lose a bit vertically and the screen did feel smaller than a 'normal' 24" model. The aspect ratio of this screen is a pretty common trend in today's market with the move to multimedia orientated displays and widescreen formats. With a pixel pitch of 0.265mm, the text was comfortable and of a decent size for prolonged office use. Picture quality was very good using the HDMI and D-sub connections, with HDMI providing a slightly sharper image. As I've already said earlier in the review, it would have been good to see DVI provided as well. You will want to turn down the default brightness setting for the screen as the luminance is too high out of the box. A reduction from 90% to around 20 - 25% should return a more comfortable luminance around the 120 cd/m2 mark out of the box. The screen can offer a decent luminance adjustment range from the brightness control which is good, and can reach as low as ~87 cd/m2 which should be ok for most users, even in darkened working conditions. There is a preset mode available for 'text' from the ECO mode option and this locks the brightness control at 20%. The 'internet' option is a little brighter with a 40% brightness setting. These might be useful to some people depending on how they have their normal mode set up. Ergonomically the screen was limited, with only a stiff tilt option available. It would have been nice to see height, pivot and rotate available from the stand which can be useful in office situations. It would have also been good to see some USB ports included on this model which are sadly missing. These are useful for connecting external devices like cameras and printers and it was a shame there were none available. The integrated 2x 2W speakers are very quiet and so only really suitable for the odd 'office' noise, or maybe the occasional Youtube video or mp3. They aren't up to much though. 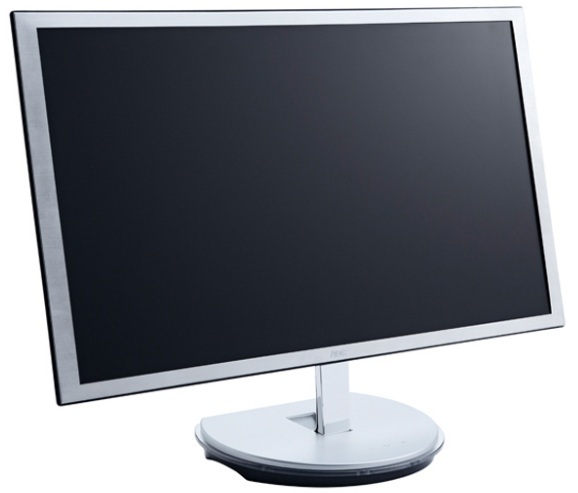 The screen is designed to run at its native resolution of 1920 x 1080 and at a 60Hz recommended refresh rate. However, if you want you are able to run the screen outside of this resolution. We tested the screen at a lower 1680 x 1050 resolution to see how the screen handles the interpolation of the resolution. At native resolution the text was sharp as you can see from the top photograph. When you switch to a lower resolution the text is quite a bit more blurry. There is some overlapping of the text across sub-pixels as you can see in the photo which results in this blurring. Native resolution is recommended where possible. The i2353 is rated by AOC as having a 5ms G2G response time which implies the use of overdrive / response time compensation (RTC) technology, used to boost pixel transitions across grey to grey changes. The panel being used is an LG.Display LM230WF3-SJC1. There is no specific control over the overdrive impulse via the OSD menu as there is with some screens and so you will have to rely on the factory set up. Have a read about response time in our specs section if any of this is new to you. I have provided a comparison of the i2353 first of all above against 4 other 23" screens we have tested which use IPS panel technology and W-LED backlighting. 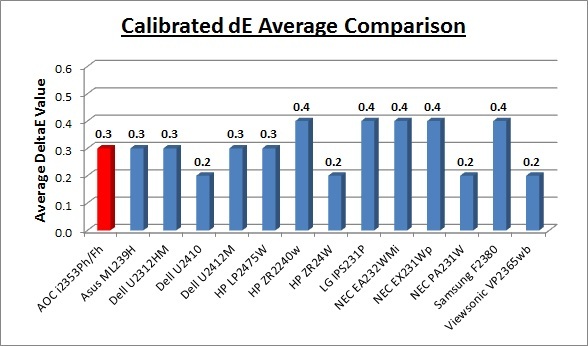 The i2353 performed quite similarly to the LG IPS231P and NEC EA232WMi in practice. This might seem counter-intuitive since the LG and AOC models are listed with a 5ms G2G response time, suggesting a heavy dose of overdrive is being used. On the other hand the NEC has a quoted 14ms response time and does not use any form of overdrive technology. In practice however the AOC and LG models show quite a noticeable amount of motion blur and do not show the kind of smooth, sharp movement you might expect from a fast IPS panel. They both perform more like the NEC in real use. This goes to show that you can't always trust a reported spec. It seems that the overdrive impulse is very light on the AOC i2353, if it is even used at all. There are at least no overshoot or dark/pale artefacts caused by the overdrive impulse which can cause an issue if the overdrive technology is applied too aggressively or poorly controlled. The Dell U2312HM and Asus ML239H show less motion blur in practice and do have a faster response time. The Dell dos introduce a small dark overshoot as you can see from the above images. Both of those screens are more suited to gaming than the i2353 however due to their faster response time. I have also provided a comparison of the i2353 against some other popular IPS models in a similar size, ranging from 21.5 to 24". As you can see the i2353 is not as fast as the Dell U2311H which is a highly regarded screen in terms of its responsiveness. The Dell U2412M was also good although like the smaller U2312HM there was a dark artefact and overshoot present. The Dell U2410 and HP ZR2240w also showed low levels of motion blur and no obvious overshoot. 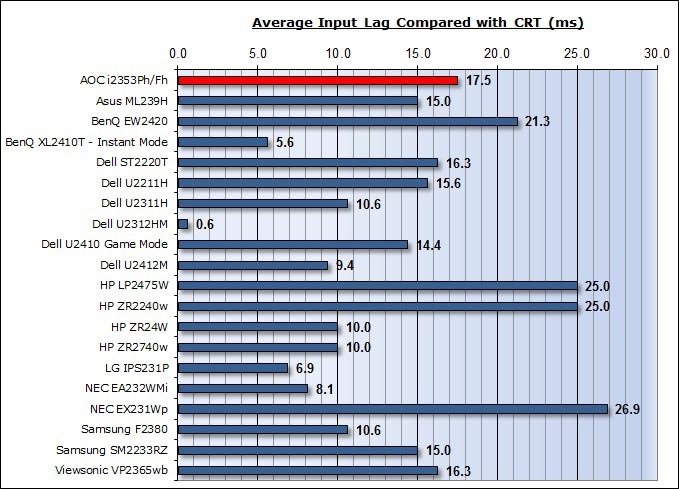 The AOC does unfortunately fall behind a bit in pixel response times in practice compared with these other IPS models. It's not super-slow and doesn't show any severe ghosting or anything, but it does show more motion blur than some of these other competing models. It doesn't live up to its 5ms G2G spec certainly. I've also included a comparison above against two gamer-orientated screens, both featuring heavily overdriven TN Film panels, and 120Hz technology. The pixel responsiveness of both of these is ahead of the i2353, and the 120Hz frequency allows for improved 120fps frame rates and the support of 3D content as well. The BenQ XL2410T does show some even more obvious RTC overshoot in the form of very dark trails behind the moving image (speech bubble and head) which is unfortunate, and a sign that the RTC impulse is too aggressive. The Samsung 2233RZ remains our champion in this test. The responsiveness of the i2353 should be ok for some moderate gaming but it is not as responsive as many of the other IPS screens in this size range which show less motion blur and smooth movement of images. The 5ms G2G quoted spec is a bit misleading and the screen seems to behave more like a screen without an overdrive impulse applied. There are faster options for more serious gaming available but it can certainly still handle some light to moderate gaming without issue. Aspect Ratio Control - The i2353 supports aspect ratio control options through the OSD 'extra' menu. There are options for wide and 4:3 aspect only. There is no defined 1:1 pixel mapping mode or an automatic detection of the aspect ratio. Preset Modes - There is a 'game' preset mode available in the menu if you want it which basically acts as a preset brightness setting which sets the monitor at 60%. This might be useful as a quick access to a higher brightness rather than changing your customised normal mode all the time if you want brighter conditions for gaming. The dynamic contrast ratio is available in the OSD menu as well although it will revert you back to the standard preset mode (from game) and will control the backlight intensity from there. This does work reasonably well with a DCR of up to ~2031:1 available. Input lag is described as the lag between the output from a graphics card and the image which is displayed on the screen you are using. This should not be confused with pixel response time which describes the speed at which a pixel can change from one orientation to another. Pixel response times impact aspects such as motion blur and ghosting, whereas input lag is a delay between what is sent to the monitor, and what you actually see. Of course both do contribute to the overall performance and experience of the display when used for gaming. Traditionally input lag has been widely measured by hooking up a CRT screen to the same graphics card and PC as the TFT display. By cloning the output, the user could provide a comparative test of the output of the CRT vs. the output of a TFT. A CRT would show no lag on top of the output from the graphics card which is vital for those wanting to play fast games, where reaction times are key. This is what many users are used to, having come from older CRT displays. Many high end gamers still use CRT's as well for high refresh rates and frame rates and so the move to a TFT can be worrying, especially when you start throwing in a conversation about lag of the output image. By running the screens side by side in this way in clone mode, you can often see that the TFT lags behind the CRT. This is sometimes noticeable in practice even, but stopwatch programs have been used for many years to give a way to record and synchronise the output so that the difference could be recorded. High shutter speed photographs can then be taken to show just how much the TFT lags compared with the CRT. The level of lag really depends on the TFT display, and is controlled by many signal processing factors including, but not limited to the internal electronics and scaling chips. Some manufacturers even take measures to help reduce this, providing modes which bypass scaler chips and options which reduce the input lag. These are often reserved for gamer-orientated screens but the results are often quite noticeable. This stopwatch method has been used for many years by many review websites and end users. It's easy to set up, doesn't cost anything and allows a reasonable comparative view of a CRT output vs. a TFT output. It can also be useful for providing a comparison between different models over time. The method is admittedly not 100% accurate however. There are areas of inaccuracy inherent to this method. Some stopwatch programs are based on flash which can introduce issues with frame rate support, especially when viewed from an internet source and browser. The programs can introduce a degree of error if vsync is active and due to 2D native refresh rate settings of 60Hz. There's never been a defined standard for measuring input lag and so this has been used for a long time and widely accepted as a decent enough representation of what a user may experience. Some websites take this whole area one step further and even use an oscilloscope and photosensor to measure the input lag of a display. This is of course an even more precise measurement and can help you show the true image lag along with the typical response times of a pixel transition. This is then used to give you both the overall experienced 'lag' of the image and the lag specifically between the electronics and the pixel change instruction (the pure signal processing time). We do not have access to such a method at this time and of course it would not come cheap. We are investigating alternative means to measure input lag in the future for our reviews in an effort to help provide even more accurate results. We did not want to completely remove this section since I know it is useful to many readers and it would be missed. 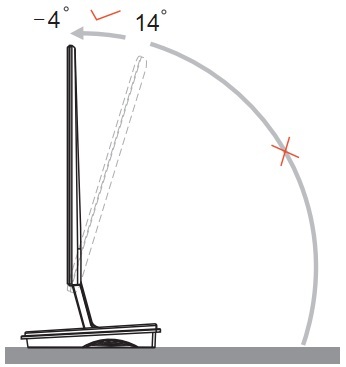 While it might have varying degrees of accuracy, I will say that this method has been used for many years by many sources and although there is likely a varying degree of error introduced in this method, it can still allow you to give a reasonable comparison between displays. Classification of the lag into low, medium and high for instance is possible and the method can help give you an idea of the relative output of a TFT compared with a CRT. It's an indication though as opposed to a precise measurement. If you are particularly bothered about input lag then I would encourage you to compare results between sources and refer to other review sites as well where methods like this are used. In many cases the figures are actually quite comparable but by all means if you need absolute measurements refer to other sources as well to help with your decision. On to our tests then in their current form. The AOC i2353 showed 17.5ms of input lag on average in these tests, ranging up to 30ms maximum. This was a moderate level of lag and quite similar to some of the other screens we have tested like the Asus ML239H in this test (15ms). A lag of 17.5ms average would put this in class 2. For reference, Prad.de have also tested this screen using the aforementioned oscilloscope methods for added accuracy, and have measured an overall lag in the image which coincides with this number well at 18.1ms. 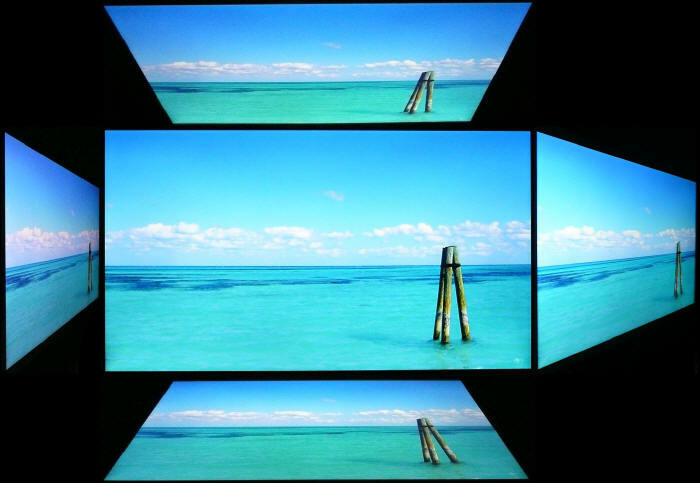 16:9 aspect ratio is more suited to videos than a 16:10 format screen, as it leaves smaller borders on DVD's and wide screen content. Good to see 2x HDMI available for connecting multimedia devices easily. Additional DisplayPort is missing which might have been useful as it is increasingly popular for external Blu-ray / DVD player connectivity. Black depth and contrast ratio are good for an IPS panel although not as good as some other models we have tested. Detail in darker scenes and shadow detail should not be lost due to these measurements. 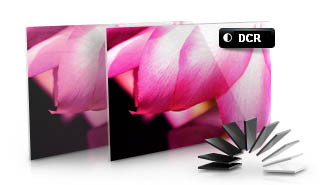 Dynamic contrast ratio is available and works to a moderate level, up to about 2031:1 maximum. 'Movie'' preset brightness mode is available from the preset menu which automatically sets the screen at 80% brightness. Moderate pixel responsiveness which should be able to handle fast moving scenes in movies without real issue. 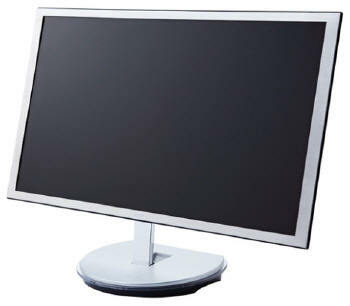 Wide viewing angles thanks to e-IPS panel technology meaning several people could view the screen at once comfortable and from a whole host of different angles. Limited and stiff ergonomic adjustments available from the stand meaning it could be difficult to obtain a comfortable position for movie viewing in some scenarios. Some noticeable backlight leakage from the sample we had along the bottom edge. Leakage along any of the edges has the potential to become distracting when watching movies, especially where black borders are present. No picture in picture (PiP) or picture by picture (PbP) modes available on this model. The AOC i2353 offered a lot on paper but I did feel it ended up being a fairly modest offering in the 23" IPS market to be honest. That's not to say it's a bad screen, I just think it could have been a bit better in some areas. On a positive note, the design is very attractive and the brushed aluminium finish, ultra-thin profile and attractive base and stand looked very nice on the desk. It was certainly a nice looking piece of kit. In some ways the features and extras were good, and it was nice to see 2x HDMI available, some integrated speakers and a nice set of options from the OSD menu. On the other hand it felt like a few things were missing such as a DVI interface (or at least a DVI > HDMI cable), USB ports and a better range of stand adjustments. Height adjustment was missed and even the tilt was not really very easy to use. Although stereo speakers were available they were very quiet and not really that good. Again maybe a little more attention and these could have been useful. It just felt like a few corners were cut here I think. Performance wise the default setup was reasonable and at least offered a pretty good gamma and white point. The luminance was too high as normal, but not hard to change and the backlight range was good. Once calibrated the screen performed well and offered some of the good all round performance you would expect from an IPS panel. Black depth and contrast ratio were pretty good although not quite as good as some other competing models. At least there was a dynamic contrast ratio which worked here, if only to a moderate degree. Uniformity of our test sample was not perfect unfortunately and the backlight bleed we saw was an issue. Hopefully this will vary from sample to sample so it may not be an issue if you are considering purchasing this model. Responsiveness did not live up to its advertised spec at all which was a shame, although it was ok for moderate levels of gaming. I think to summarise overall, the i2353 is a decent general all-round screen, not excelling in any particular area, but offering reasonable performance in most uses. It has a nice design and would perhaps best fit in a modern office environment for general day to day use, some web and text work and maybe some occasional light gaming and movies. If you have enjoyed this review and found it useful, please consider making a small donation to the site.